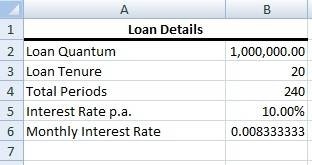 In one of my previous articles: How To Create An Amortisation Schedule For Your Home Loan?, I discussed about using Excel to compute the interest and principle payments for each period. In this article, we will go a step further by explaining about the set-up of the amortisation schedule for mortgages with different rests. 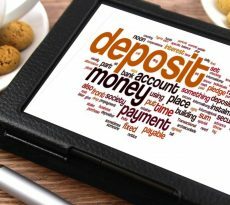 Rest, or the compounding period, is the frequency in which the outstanding loan amount is calculated. The more frequently the loan is calculated the lower the interest payments will be, all else being equal. 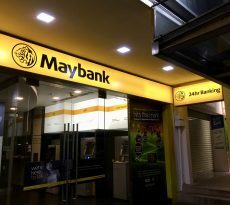 This is because each time repayment is made, the outstanding loan amount is reduced and so will the interest chargeable if the loan is re-calculated. 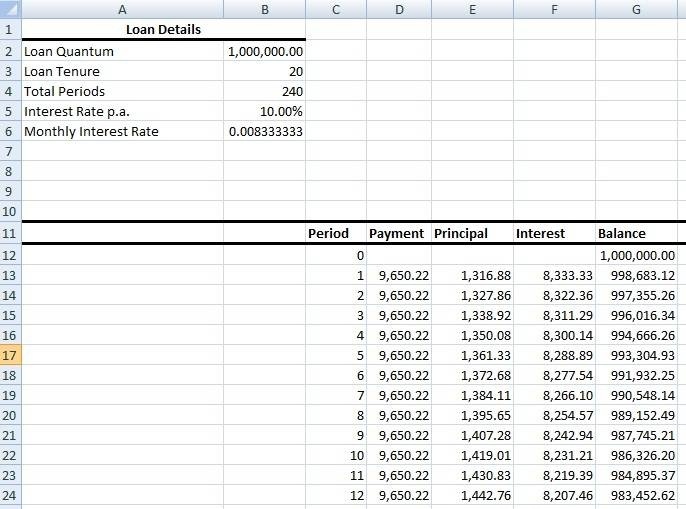 To illustrate, if a loan on an annual-rest basis is repaid monthly the interest for the entire year will still remain the same as the financier uses the outstanding loan at the beginning of the year for interest computation. 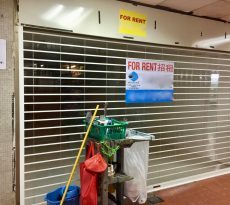 Most Singapore home loans follow a monthly rest, while a few is on daily- and annual-rest basis. Using the below loan details, we will proceed to create the amortisation schedule for daily-, monthly- and annual-reducing loans. The Excel template workbook with pre-set formulas used throughout this article can be downloaded here. There are two main advantages of a mortgage that is calculated daily. Firstly the total interest payable will be relatively lower. Secondly, if partial repayment is made, the interest that will be charged is reduced by the next day since the outstanding principle is calculated everyday. So how then do we create the amortisation schedule? With the aforementioned loan, we need to find the number of compounding periods for the entire loan duration as well as the daily interest rate. Next, we calculate the daily interest rate. 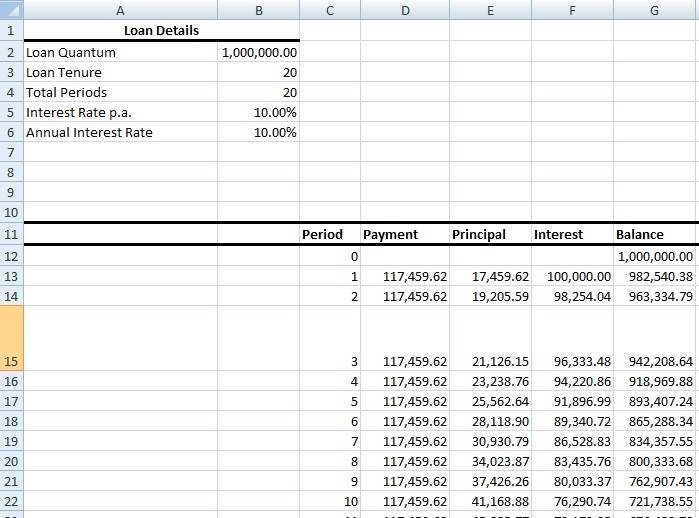 In the Excel sheet, we enter these loan details. 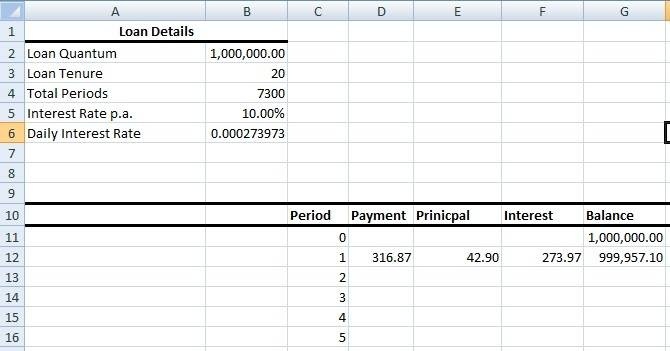 Instantaneously, after entering the loan details, the payment, principal, interest and balance for the first period will appear in the Excel sheet with the pre-entered formulas, as seen below. To understand the formulas, please refer to my previous article. Select D12:G12 then drag and pull to the 7,300th period. However, the repayments are monthly so we need to find the total amount for 30 days (We assume here that there are 30 days in each month). But repayment is made monthly. So we must divide all the yearly figures by 12. For simplicity’s sake, throughout this section, we assume that each month has 30 days and so for the monthly outlay for the daily-reducing loan, we simply sum up the figures for 30 days. 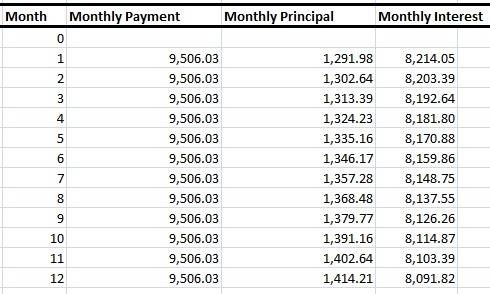 Now, we compare the monthly payment, principal and interest across the three types of rests. As an example, we only use the first month’s amorisation schedule. 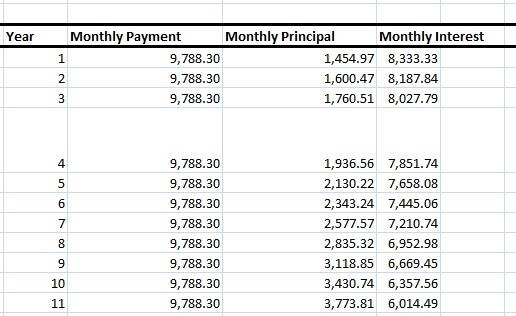 From Table 1, we see that the total payment and interest is the least for the daily-reducing loan. In contrast, the monthly interest is the same for the loans on monthly- and annual-rest. This is true only for the first month after which the interest for the former will fall below the latter. In Table 2, we clearly see the difference in interest payment for the first year. As expected the interest is always lower for the daily-rest loan, followed by monthly, and finally annual. If that isn’t enough, we note that the total interest payable for the entire loan duration is lowest for the daily-rest loan. With the daily-rest, you can reap interest-saving of $(1,316,051.9 – 1,313,134.5) = $2,917.40 as compared to the monthly-rest. When comparing the monthly-rest with the the annual-rest, the interest-saving is even greater at $(1,349,192.5 – 1,316,051.9) = $3,3140.6. So after reading this article, I hope you understand the importance of selecting a loan with a shorter rest!